IDENTITY AND EXPERIENCE. The Constitution of the Human being According to early Buddhism by SUE HAMILTON. In early Buddhist texts human beings are analysed in terms of five 'bundles' one physical - the body - and four mental - feelings,apperception, volition, and consciousness. These are traditionally understood to be the five constituent 'part' of which the human being is comprised. For her study of the texts, the author has found that in fact the bundles are the operating factors of experience rather than the constitutional parts. The Buddha did not ask 'What is a person?' but 'How does a person operate?' For objects he substituted processes, and the 'bundles' teaching ties in with his explanation of life as a casual process which, through normally leading to suffering, can be reversed in order to attain salvation. 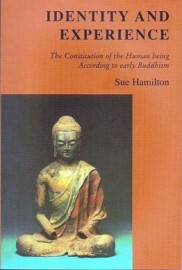 In taking this new approach, Sue Hamilton presents a breakthrough in our understanding of early Buddhism, showing the Buddha's analysis of the human condition as an integral shole. This work offers a firm foundation for future research.